Stem: trunk generally flared at base; branches spreading to +- pendent, tips often upturned; young shoots 4-sided, in flat clusters, held horizontally. Leaf: opposite, 2-ranked, +- not appearing whorled in 4s, closely appressed, scale-like, exposed part +- as long as wide. Pollen Cone: terminal. Seed Cone: erect to reflexed, woody, ovoid-oblong, tapered to point, maturing 1st year; scales in 4--6 pairs, +- overlapping, sharp-pointed near tip, thin, oblong, acute, leathery, middle 2--3 pairs fertile. Seed: (1)2 per fertile scale, wings 2, +- equal; cotyledons 2. Habit: Tree 30--70 m. Stem: bark 1--2 cm thick, cinnamon-red, fibrous; young shoot upper surface glossy dark green, lower surface generally faintly white-streaked. Pollen Cone: red-brown turning dark gray. Seed Cone: 10--19 mm, light brown. Seed: 4--6 mm, narrow, elliptic, light brown. Chromosomes: n=11. Ecology: Coastal conifer forest; Elevation: < 1800 m. Bioregional Distribution: NCo, KR, NCoRO (Del Norte, Humboldt cos.); Distribution Outside California: to Alaska, Montana. 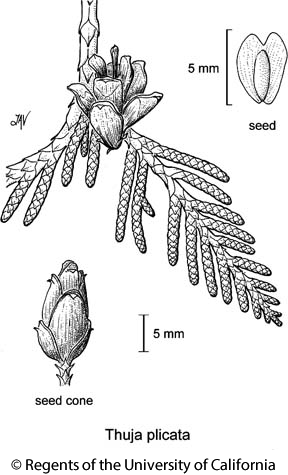 Citation for this treatment: Jim A. Bartel 2012, Thuja plicata, in Jepson Flora Project (eds.) Jepson eFlora, http://ucjeps.berkeley.edu/eflora/eflora_display.php?tid=46527, accessed on April 25, 2019. No expert verified images found for Thuja plicata. NCo, KR, NCoRO (Del Norte, Humboldt cos.); Markers link to CCH specimen records. Yellow markers indicate records that may provide evidence for eFlora range revision or may have georeferencing or identification issues. Purple markers indicate specimens collected from a garden, greenhouse, or other non-wild location.